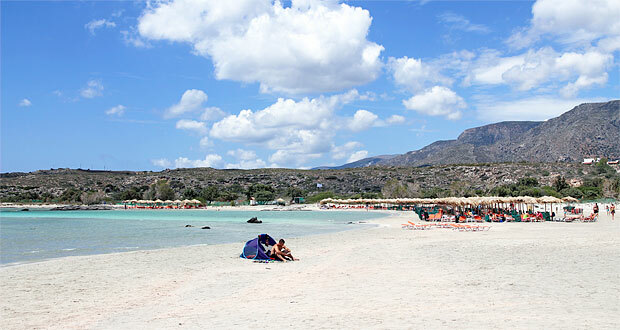 Elafonissi is located in the southwest corner of Crete, far away from the busy holiday resorts. Actually, it is an island, but at low water, it becomes a peninsula, which you can reach on foot via a narrow tongue of sand. The beach is located in a breathtaking natural resort. Impressive mountains, sand in pink shades, beautiful lagoons with turquoise water and an island, which is laid out as a conservation area due to the sea turtle caretta caretta, which is protected as an endangered species. There are large areas with fine, pale sand, which has a pink shade in certain areas. 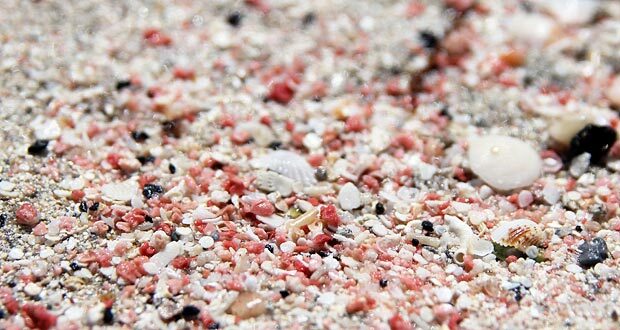 This is due to tiny pieces of pink sea shells in the sand. The water is entirely clear and also very shallow. Almost like a lagoon. There are several sections with sun lounges and sunshades. There are also showers, changing facilities and toilets, which costs 50 cents to use. Free parking close to the beach. There are many visitors at the main beach, but if you wish a little more peace and quiet, there are many rocky bays on the island. These are also popular with naturists. Elafonissi is very child-friendly. The sand is soft and there is lots of room to play. The water deepens very slowly, which is perfect for children. 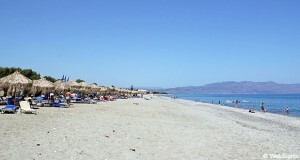 The winds at Elafonissi make kite surfing very popular, but you are not able to rent equipment. A few hundred metres out in the water there is a reef, which is very suitable for snorkelling. There are two beach cafés at the beach that serves refreshments and light meals. 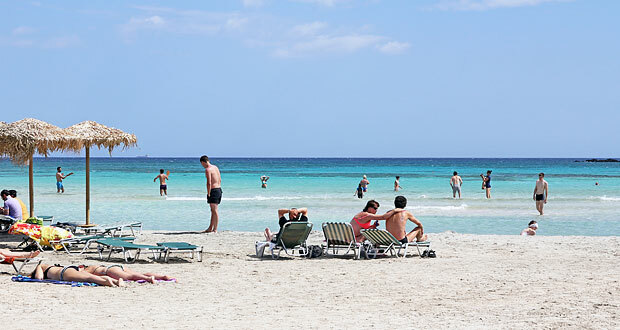 Luckily, Elafonissi is located far from the large holiday resorts. 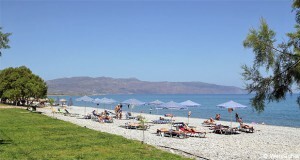 The closest holiday resort is Paleochora, which is located about an hour’s drive west of Elafonissi. However, most people, who visit Elafonissi, come from the holiday resorts at the Chania coast, such as Platanias, Agia Marina and Gerani. It takes about one and a half hour to drive from these towns.